Low back pain (LBP) is an enormous socioeconomic and emotional burden. In spite of vast efforts the number of LBP sufferers remain stagnant  and back pain endures as a clinical conundrum. For decades we have scanned, screened and tested. We have treated short, weak and tight muscles. We have ‘stabilized’ and performed movement screenings. Joints have been popped, cracked and allegedly realigned. We have prescribed pills, needled taut bands and injected steroids into nerve roots. Spines have been cut, carved and fixated. Our patients are not cars. And we are not mechanics. Stress and lifestyle factors’ influence on heart disease is an undisputed fact. Ironically, it seems as though many clinicians are reluctant to recognize the same mechanisms in LBP, which is still largely considered as an ‘injury’. 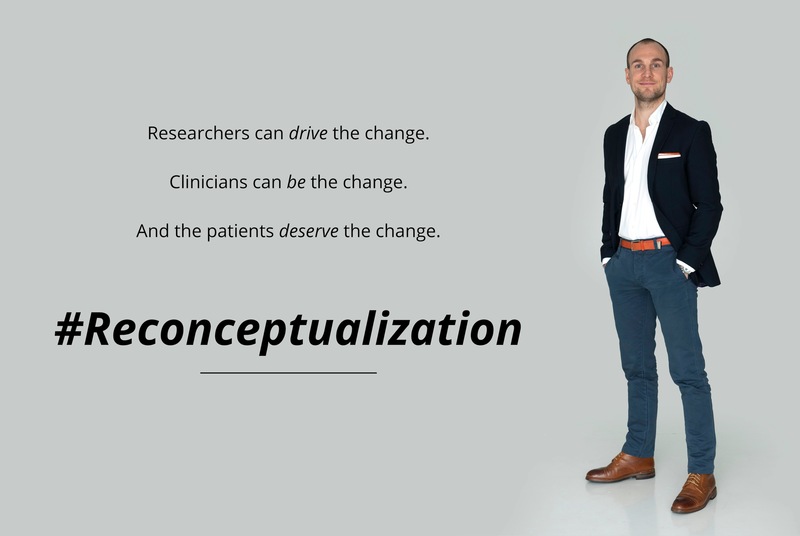 To move this field forward there is need for reconceptualization. The picture of our bodies as reductionist objects is antiquated. We cannot reasonably expect centuries of evolution to be marginalized into misaligned joints, weak muscles or degenerated discs . We need to assess and treat the human body less like a machine and more like an ecosystem. An ecosystem where multiple factors will influence patient presentations and outcomes. Fear, lack of self-efficacy, lack of confidence, fear-avoidance behavior, poor sleep, frustrations, insecurities and other stressors all influence the delicate balance in our patients’ ecosystem. The need to reconceptualize people`s notion of pain . Medical professionals up to date with the current literature will no longer consider LBP, especially in the persistent and recurrent phase, to be caused by tissue injury and noxious inputs to the nervous system. In contrast, pain is considered to be an output from the brain [2,9]. Structure, biomechanics and nociception will continue to play a role in back pain management, but they can no longer be the cornerstones of our interventions. We must cater to the more fundamental needs of our patients, not their ‘short muscles’ or ‘worn out’ disks. This communication must pervade professions and educational institutions. It must extend from stakeholders and politicians at the very top to the devoted clinicians seeing the patients every day. The public deserves to learn that there are no quick fixes. No magic bullets. As clinicians we need to abandon narrowly focused professional shelters and move towards interprofessional understanding and respect and encourage multidisciplinary research and clinical practice. The immense gap between academia and clinical practice . The shear volume of research is incomprehensible in day-to-day practice, and tools for easy and structured implementation are strongly needed. The overwhelming amounts of research possibly leads to reduced implementation, which in turn might lead to guideline discordance and ultimately results in suboptimal patient management . The need to rethink the front line of care for back pain . We must ensure that messages to patients are delivered consistently and precisely and that this communication remains guideline concordant across health professions. Health care is currently imbued with vested interests. Many systems reward procedures and services not supported by evidence. This likely fuels a seemingly never-ending hunt for mechanistic pathoanatomical explanations for LBP, with expensive scans and invasive interventions that have questionable health benefits. Patients with back pain should consult practitioners who primarily deal with musculoskeletal conditions to ensure that care is delivered from evidence-informed clinicians competent within this field [13,14]. This is highlighted by recent work indicating many primary care practitioners provide guideline discordant management [15-17]. Thus, we need to leave our professional sanctuaries. We need to taste the cognitive dissonance and dare to admit we might be wrong. We need to stop playing Gods and start playing by the rules. The rules of science and evidence-based practice. In the era of physical inactivity , there is a desperate need for movement. Not expensive exercise machines or special shoes, but natural movement. Pleasurable movement. In all its simplistic complexity. As the burden of physical inactivity continues to rise, so too does the demand for competence to accommodate the sequelae of this development. This calls for more collaboration between disciplines including general practitioners, chiropractors, physiotherapists, strength and conditioning coaches and personal trainers. Physical activity will not solve the pandemic of LBP, but it seems more than obvious that it will reduce its burden. Clinicians need to change their role. For decades we have claimed magical powers and appointed ourselves in charge of patients’ health and well-being. The time has come to change this role from operator to interactor. We must be team players, not captains. We need to listen, not speak. Empathize, not moralize. In short, we need to bring the care back into health care. While implementation of evidence-based practice has been an indisputable success for modern medicine, our search for ‘best practice’ might have focused too much on scientific methodology and our clinical repertoire. Let us get back to why we all do this: the patients . We need to confront the ‘guruism’ within back pain care. Whereas a considerable demand exists for pioneers to lead research and clinical practice, there is certainly no shortage of supply from self-proclaimed experts attempting to fill these roles. Unfortunately, their statements are often based upon anecdotes with little or no substantiating evidence. Some are welcomed into colleges and universities, which may provide artificial credibility rather than scientific scrutiny. This professional indolence has led to survival of many fossilized diagnoses and technique systems invented in a time where evidence-based practice was mere a wishful prospect and not the archetype of medicine . Embrace stratified models of care. Subgrouping different low back pain patients is quickly becoming the zeitgeist in modern LBP management and several publications are showing promising results [21-24]. While vast amounts of work remain, the future of different stratification models certainly holds potential for the millions of people suffering from LBP. The Achilles heel in this process might very well turn out to be the actual implementation of this ongoing research and not the quality of the evidence itself. In all its brutal honesty, we must admit it. We have stabbed our patients in the back. We have not lived up to the ancient philosophy of ‘primum non nocere’. The time for change is long past due. The time is now. Let us move patients away from simplistic models of injury and faults. Away from pathologic scans and shiny scalpels. We can gravitate towards a new dawn for back pain management. Researchers can drive the change. Clinicians can be the change. And the patients deserve the change. Jørgen Jevne is a dedicated musculoskeletal clinician with a degree in physiotherapy and chiropractic, practicing in a private clinic in Hønefoss Norway. He is also a writer, lecturer and part-time researcher. Hoy, D., March, L., Brooks, P., Blyth, F., Woolf, A., et al. : The global burden of low back pain: estimates from the Global Burden of Disease 2010 study. Ann Rheum Dis, 2014. O’Sullivan, P.: It’s time for change with the management of non-specific chronic low back pain. Br J Sports Med, 2012. 46(4): p. 224-7. Mafi, J.N., McCarthy, E.P., Davis, R.B., Landon, B.E. : Worsening trends in the management and treatment of back pain. JAMA Intern Med, 2013. 173(17): p. 1573-81. Deyo, R.A., Mirza, S.K., Turner, J.A., Martin, B.I. : Overtreating chronic back pain: time to back off? J Am Board Fam Med, 2009. 22(1): p. 62-8. Deyo, R.A., Von Korff, M., Duhrkoop, D.: Opioids for low back pain. BMJ, 2015. 350: p. g6380. Martin, B.I., Turner, J.A., Mirza, S.K., Lee, M.J., Comstock, B.A., et al. : Trends in health care expenditures, utilization, and health status among US adults with spine problems, 1997-2006. Spine (Phila Pa 1976), 2009. 34(19): p. 2077-84. Melzack, R. , Katz, J.: Pain. WIREs Cogn Sci, 2013. 4: p. 1-15. O’Sullivan, P. , Lin, I.: Acute low back pain: beyond drug therapy. Pain management Today, 2014. 1(1): p. 1-13. Greenhalgh, T., Howick, J., Maskrey, N., Evidence Based Medicine Renaissance, G.: Evidence based medicine: a movement in crisis? BMJ, 2014. 348: p. g3725. Westfall, J.M., Mold, J., Fagnan, L.: Practice-based research–“Blue Highways” on the NIH roadmap. JAMA, 2007. 297(4): p. 403-6. Hartvigsen, J., Foster, N.E., Croft, P.R. : We need to rethink front line care for back pain. BMJ, 2011. 342: p. d3260. Briggs, A.M., Slater, H., Smith, A.J., Parkin-Smith, G.F., Watkins, K., et al. : Low back pain-related beliefs and likely practice behaviours among final-year cross-discipline health students. Eur J Pain, 2013. 17(5): p. 766-75. Fritz, J.M., Childs, J.D., Wainner, R.S., Flynn, T.W. : Primary care referral of patients with low back pain to physical therapy: impact on future health care utilization and costs. Spine (Phila Pa 1976), 2012. 37(25): p. 2114-21. Fullen, B.M., Baxter, G.D., O’Donovan, B.G., Doody, C., Daly, L., et al. : Doctors’ attitudes and beliefs regarding acute low back pain management: A systematic review. Pain, 2008. 136(3): p. 388-96. Fullen, B.M., Baxter, G.D., O’Donovan, B.G., Doody, C., Daly, L.E., et al. : Factors impacting on doctors’ management of acute low back pain: a systematic review. Eur J Pain, 2009. 13(9): p. 908-14. Buchbinder, R., Staples, M., Jolley, D.: Doctors with a special interest in back pain have poorer knowledge about how to treat back pain. Spine (Phila Pa 1976), 2009. 34(11): p. 1218-26; discussion 1227. Blair, S.N. : Physical inactivity: the biggest public health problem of the 21st century. Br J Sports Med, 2009. 43(1): p. 1-2. Sackett, D.L., Rosenberg, W.M., Gray, J.A., Haynes, R.B., Richardson, W.S. : Evidence based medicine: what it is and what it isn’t. BMJ, 1996. 312(7023): p. 71-2. Zusman, M.: Belief reinforcement: one reason why costs for low back pain have not decreased. J Multidiscip Healthc, 2013. 6: p. 197-204. Hill, J.C., Whitehurst, D.G., Lewis, M., Bryan, S., Dunn, K.M., et al. : Comparison of stratified primary care management for low back pain with current best practice (STarT Back): a randomised controlled trial. Lancet, 2011. 378(9802): p. 1560-71. Vibe Fersum, K., O’Sullivan, P., Skouen, J.S., Smith, A., Kvale, A.: Efficacy of classification-based cognitive functional therapy in patients with non-specific chronic low back pain: a randomized controlled trial. Eur J Pain, 2013. 17(6): p. 916-28. Foster, N.E., Hill, J.C., O’Sullivan, P., Hancock, M.: Stratified models of care. Best Pract Res Clin Rheumatol, 2013. 27(5): p. 649-61. Childs, J.D. , Flynn, T.W. : Clinical decision making for low back pain: a step in the right direction. J Orthop Sports Phys Ther, 2014. 44(1): p. 1-2.